Hi, I am interested in your 1931 Dodge Other Dodge Models (stock #1694-TPA) listed on Autotrader for $17,995. I'd like to get more information about this vehicle and confirm its availability. 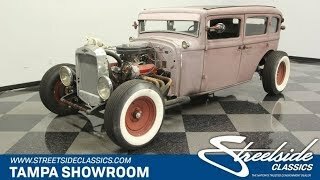 A great rat rod is all about an unashamed performance appearance with secret cool rewards hidden throughout, and this 1931 Dodge Sedan does it perfectly. More than just a slammed outlaw presentation, you have great details that keep people talking about your machine for much longer than the cars that cost five times as much. This Dodge has an industrial toughness that cannot be denied. You see in how the body still shows the marks from where it was chopped, and also where it was channeled over the frame to give it that ultra-low look. Everything on this rat rod is done with a bit of a hidden purpose. For example, the roof might look like it has the classic vinyl top that came on these 1930s machines, but unlike those factory cars, it also snaps away in case you want to be open to the world. And the details are absolutely terrific, like the crankshaft front bumper, wrenches for door handles, commercial-style headlights, bullet-style taillights, and whitewalls on classic red steelies. And its all wrapped in a purple patina that looks like it was stashed away in a barn for decades. So they spent a lot of time and effort making sure this has the right worn-in look, but its really a $30,000 build completed in 2017. Open the door, and the full rat rod experience continues. Youre going to love watching people be amused at the park bench used for seating (and yes, there are seatbelts!) Theres old metal signs used to complete the interior. Were especially fond of the Interstate Batteries sign that stretches across both doors of the drivers side a very artistic touch. Grabbing the tall gearstick will instantly make you feel like the Rat Fink. Thats why this will always make a very charismatic first impression. But once again, take a moment to look at the details to find the really cool stuff. Theres an integrated steamer trunk in the rear for storage, screwdriver for turn signal stalk, and the tool box bolted to the floor hides essential functions like the starter, fan, fuel pump, and lights. And as you look across the dash, the AutoMeter gauges and large AutoGauge tach have been purposely weathered to give you accurate info with an authentic rat rod look. The engine bay has been engineered for a worn-in appearance, and just like the rest of the car, its secretly rewarding. You see the first signs of this when you realize the 350 cubic-inch block was painted purple to match the body. This V8 inhales deeply with an Edelbrock four-barrel carburetor, and it exhales with authority has those headers give a thunderous sound out of each side. And this mean motor also has nice supporting components like an aluminum radiator with electric fan. Out on the road, the three-speed automatic transmission, adjustable coilovers in the rear, and power brakes w/discs up front make driving this rat rod an easy experience. You know youve already fallen in love/lust with the idea of being the bad boy, especially since its at such a nice price. Call today!! !